14mm rotary position sensor with 360º mechanical rotation angle (Electrical 330º) and up to 1.000.000 cycles of mechanical life. Customizable. For sensor applications: absolute linearity up to 2% available, together with up to 1.000.000 cycles. For control applications: click effect (up to 50 detents) can match special tapers, featuring ACP’s patented detent mechanism. ACP can study other special tapers (even cut tracks, step curves with areas of constant value, etc). Through-hole and SMD configurations are available. 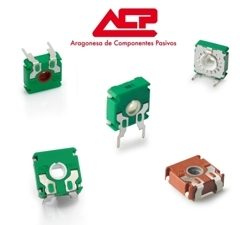 Multiple rotors, shafts and thumbwheels can be used, as with ACP’s CA14 and RS14 families.